(Nanowerk Spotlight) Scientists consider the exploration of carbon nanotubes (CNTs) for biomedical applications as a field with significant potential, leading to applications where CNTs could act as magnetic nano-heaters, drug-carrier systems and sensors which allow a diagnostic and therapeutic usage on a cellular level. The EU, for instance, has funded a four-year nanotechnology research program (Multifunctional Carbon Nanotubes For Biomedical Applications) that studies the chemical and physical properties of CNTs in order to find mechanisms which can be applied for a biomedical purpose in appropriate medical devices. Studies of their interaction with biological environments (immune response, toxicity, interaction with the single cell) will provide the basis for applying the CNT for imaging (nanoparticles-based contrast agents), sensoring (nanoparticles-based diagnostics) and cancer treatment (hyperthermia, nanotechnology-based targeted drug delivery). A new study that exploits the unique properties of single-walled CNTs (SWCNT) for biomedical purposes shows the use of SWCNTs as an efficient platform for immunotherapeutic applications. Scientists demonstrate the surface area tunability of SWCNT bundles by chemical treatment and its effect on antibody adsorption and subsequent T cell activation. T cells are central players in initiating and maintaining immune responses. An important goal of successful immunotherapy is the stimulation of T cell immune responses against targets of interest such as tumors. "We show that antibodies against the T cell CD3 complex (anti-CD3) adsorbed onto SWCNT bundles stimulate cells more effectively than equivalent concentrations of soluble anti-CD3; when immobilized on SWCNT, anti-CD3 can activate T cells at concentrations at least an order of magnitude less than antibody alone" Dr. Tarek Fahmy explains to Nanowerk. "Stimulation by antibody adsorbed onto SWCNT is significantly higher than other high surface area materials (activated carbon, polystyrene, and C60 nanoparticles), suggesting unique properties of SWCNT bundles for stimuli presentation and activation of T cells." In contrast to the majority of biomedical applications which use or propose the usage of SWCNTs in vivo – where toxicity becomes an issue – the proposed applications by the Yale scientists uses SWCNTs ex vivo with blood cells derived from the patients blood. "We find that lymphocytes can be effectively stimulated by SWCNTs," says Fahmy. "This is important for the field of adoptive immunotherapy which requires efficient activation and proliferation of lymphocytes ex vivo and the generation of large numbers of cells that can be infused back into the patient for efficient immunotherapy. Single walled carbon nanotube bundles can be adopted as a platform for efficient activation of T cells with patient derived blood when combined with antibody stimuli." Fahmy, an Assistant Professor of Biomedical Engineering at Yale University's Engineering Department, together with a group of collaborators from the departments of Biomedical Engineering and Chemical Engineering at Yale, published these findings in a paper, first authored by Tarek R. Fadel, in the June 12, 2008 online edition of Nano Letters ("Enhanced Cellular Activation with Single Walled Carbon Nanotube Bundles Presenting Antibody Stimuli"). The Yale team was motivated to undertake this research into SWCNT-based T cell activation by the unique and tunable material properties of SWCNTs. Fahmy explains two major reasons why SWCNT bundles are attractive for T cell stimulation: "First, the surface area for antibody adsorption can be tuned by altering the surface chemistry of the individual SWCNT. Second, SWCNTs can adsorb protein antigens without direct chemical conjugation of the protein stimulus making it easy to attach proteins by simple incubation at point-of-use settings, facilitating off the shelf application." The researchers established a method for modulating the surface area of SWCNTs by chemical treatment, which resulted in enhanced protein adsorption. "High-density presentation of protein stimuli induces effective cellular activity and we studied this correlation within the context of T cell activation," says Fahmy. 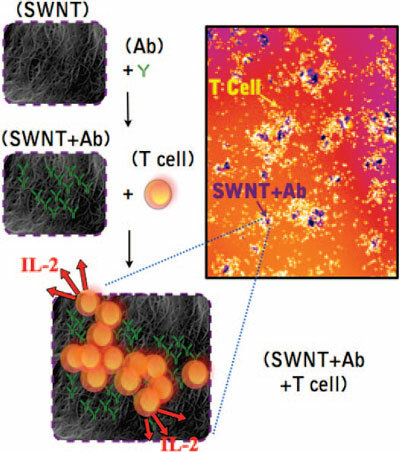 He points out that the large active surface area offered by SWCNTs is necessary for effective artificial antigen presentation and his team has exploited this property of SWCNTs to transform this material into a tunable platform for T cell stimulation. "Even when antibody presentation is normalized by surface area, SWCNT-antigen presenting bundles are more effective T cell stimulators than other materials, suggesting that they possess unique properties associated with the presentation of T cell antigens" says Fahmy. Specific potential applications for this novel approach are related to adoptive T cell immunotherapy, which is currently being used as a efficient therapeutic modality against advanced melanoma. This technique developed by the Yale scientists should further facilitate this type of applications for a wide variety of tumor antigens. The first one is a materials issue: SWCNT bundles need to be reliably produced in large enough quantities to facilitate testing by a variety of laboratories and for different T cells. Fahmy says that he envisions a solution to this problem in the near future with advances in SWCNT production techniques. A second issue that needs to be solved is related to adoptive cell transfer therapy, where T cells specific to a tumor antigen are first isolated, expanded outside the body through specific activation, then retransferred into the patient. "What is needed is a good understanding of the tumor antigens to which T cells need to be expanded against" says Fahmy. "This is a basic biological science issue that is the focus of many different tumor biology laboratories. Once this understanding is in place we envision translational potential in the short term."